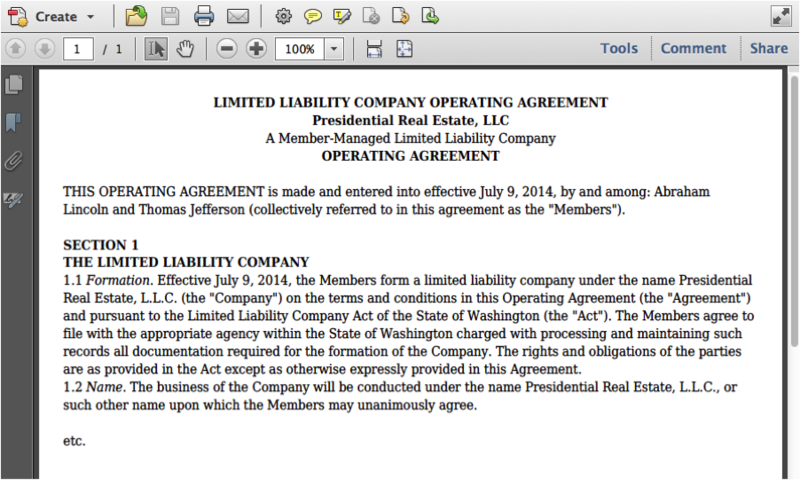 Want to create a PDF document from information you collect through an HTML form? With WebMerge that’s super easy! You can create an HTML form and a template document with merge fields in it so that when people fill out the form the input information is automatically inserted into the template document and you have a customized document ready for delivery. 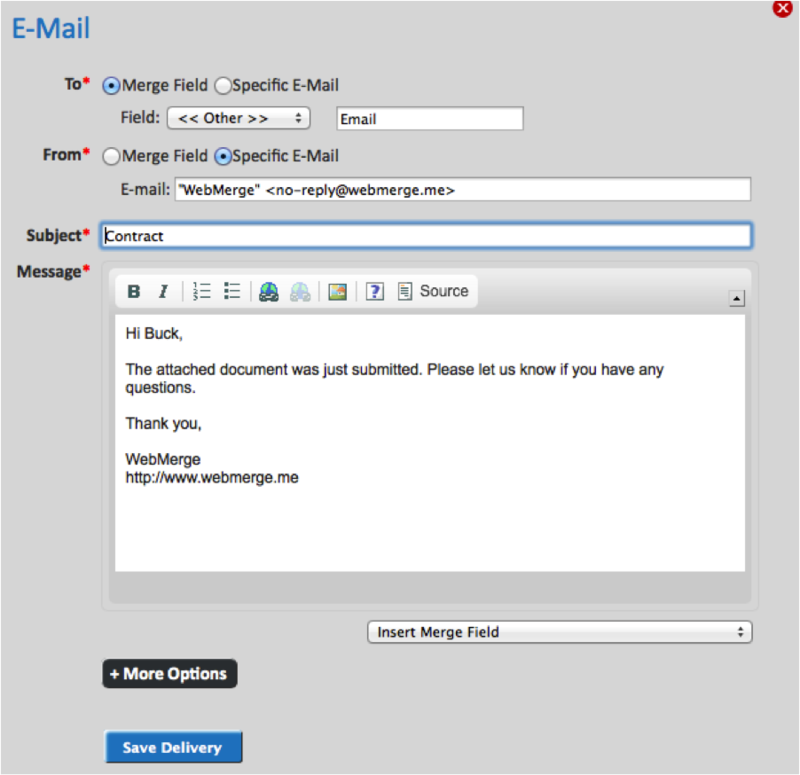 WebMerge can even deliver your document(s) for you via email if part of what you’re collecting is an email address. In this example, we will go through the process of creating an HTML form to collect information so as to auto-fill an contract between you and the person providing responses to the HTML form. First, let’s make sure we have our contract with the proper merge fields in the right places. 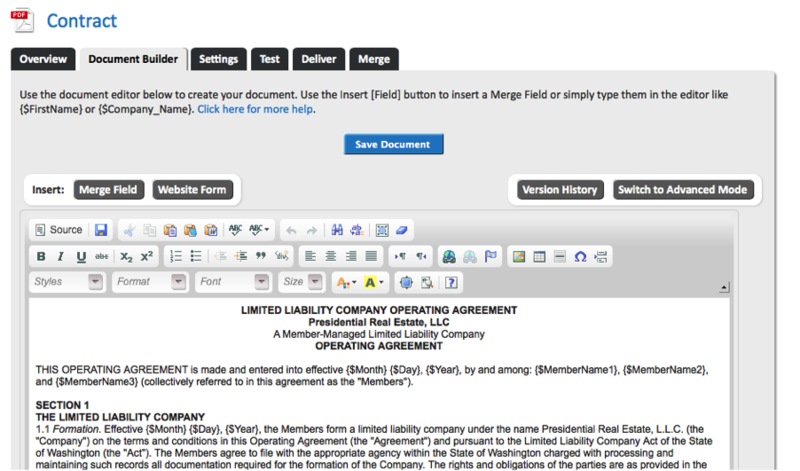 We can upload or create our template document in the documents section of our WebMerge account. Here we use the Document Builder to create our template. After we’ve built our template document, let’s specify a delivery option. Because we’re having the person who is filling out the form specify his or her own email address and we’re not including that email address in our document. We’ll select Merge Filed and Field: <<other>> in the To section of the E-Mail delivery options. Now, once we have our template made and ready for delivery, we’ll create our HTML form. We have two options here, we can do this with a form we’ve created and hosted on our website or we can use a form created and hosted through WebMerge. Let’s start with a form we want to create and host on a website of our own. Notice the action of the form should be set to the Merge URL that can be found under the merge tab in the document section of your WebMerge account and the method should be set to POST. When someone goes to your website and submits the form the data will be merged and delivered! As mentioned earlier we can also create HTML forms easily with the WebMerge Data Collection tool and host them through webmerge. 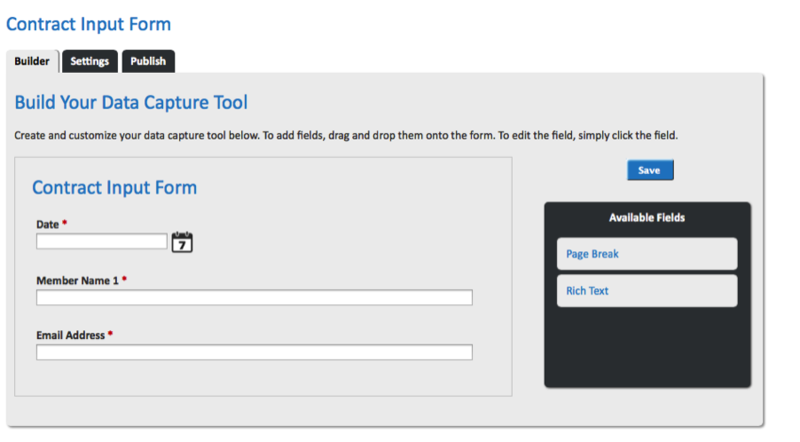 Click the create data capture button and then name the HTML form. 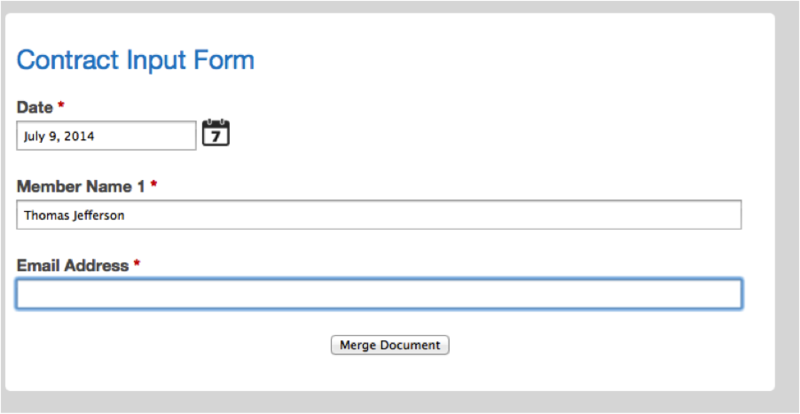 Once you have a name for your HTML form, you can choose which merge fields you would like to make into HTML form inputs. You can specify what type of input you’d like each of the inputs to be and whether you would like them to be required fields. Here we have selected a date-picker input type for our date, our Member merge field, and the email merge field we specified in our delivery options settings. After we save our form, in the publish section, WebMerge creates a URL by which we can access the HTML form we’ve just created. 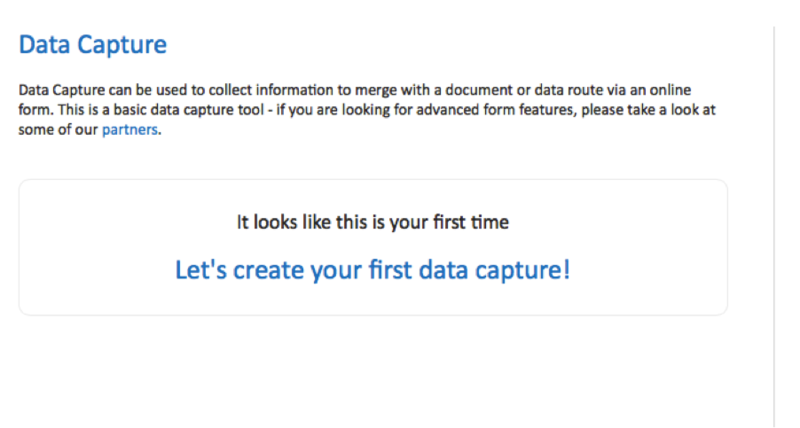 Follow the URL and you have your form ready to be filled in and automatically merged with your template document. When you get responses to your new form those responses will automatically be merged with your template document and emailed to the email address provided by the responder! There you have it! You can now collect responses from people through an HTML form, merge those responses with a template document, and send the document off via email. Should this HTML code work in a way, which wouldn't need to redirect users of the form, to go through WebMerge URL? You could submit the form to your own server, then send the data from your server (via HTTP POST request) behind-the-scenes. That's probably the best way. I may not have understood your advice but whenever I post data to merge via post with the hidden input redirect I get a copy of the merged doc jsut fine but the redirect returna a page not found message. Has WebMergeFormIntegrationThanks.html been deleted or renamed or something? Were you asking me a question? Or giving advice to Martin? If you have more questions, please create a support ticket and we'll help you from there. Is there a way to have more formatting control of the data capture? As I see it, when I build a form in data capture, each row is formatted as just an additional row below the last one... is there no way to have to columns or get a little more creative with the appearance of the data capture form? You can use CSS to customize the form, but if you're looking for a more advanced form, then we have a number of form partners that allow you much more control over the look of forms.